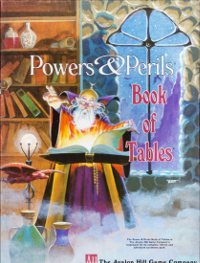 The Book of Tables is designed to aid the Referee and Players in their use of the Powers and Perils system. The seven sections of tis book contain tables and information that are divided based on the part of the system that they are used in. The book also contains an errata and comment section and new charts to help the Referee run his game. The Book of Tables, as a supplementary aid, should be used by people who have a solid grasp of the main rule books. They do not supersede, except as specified, or obviate your need for, the four main rule books. It prvides and easy reference to allow ou to use the tabular information in these books more quickly. In all cases, where questions arise, turn to Powers and Perils for the answer. The basic rules sections that are covered in this book are Character Generation, Characteristic Use, Combat, Magic, Encounters, Threasure and an Errata section to correct errors in the original rules. All changes and statements in the Errata section supersede, change or correct the specific section or statement that they refer to. The Referee should use this system in conjunction with the basic Powers and Perils rule books. Scans of the original Book of Tables.